I am so excited for tonight!!!!!!!!!!!!!!!!!!!!!!!!!!!!!!!!!!!!!!!! John Mellencamp Community > MELLENCAMP DISCUSSION > No Better Than This Tour Talk > Minneapolis, MN (1st Show) > I am so excited for tonight!!!!!!!!!!!!!!!!!!!!!!!!!!!!!!!!!!!!!!!! This day is finally here. After freezing rain for the past 2 days, I was worried that John and the band might not make it to the frozen tundra that I call home. It has been a long time since JM has been in my town and I can't wait for tonight. Focusing at work is impossible today so here I am sharing my excitement with all of you. My husband and I will be in the front row with our special t-shirts on. I tried to talk him into wearing the laminate tour pass that came with the premium package but that probably won't happen. I hope to see some other Mellenheads at the show. Enjoy!!! Re: I am so excited for tonight!!!!!!!!!!!!!!!!!!!!!!!!!!!!!!!!!!!!!!!! Awesome!! Have a great time and even if he don't wanna wear the laminate, you should!!! I know I will be wearing mine for my April shows. I wore my laminate and I came close to dancing on the stage the first night. I don't think he wanted to pull any of the 4 girls that were in the front row up there for some reason. He motioned to someone in like the 4th floor and she came up and didn't realize he wanted her up on the stage and she looked a little drunk so he kind of waved his hand like forget you then. Then he looked right at me and went to the other side of the stage. Then he pulled up a girl that managed to get to the front row from the 2nd row. My husband said I should of just thrown you up there. Have a great time at your shows guys!!! I am still in floating on a cloud today. So that is who that girl might be that ended up on stage. We saw that she was giving John his water breaks last night, then all of a sudden she was in row 1 of the pit on the left hand side and he picked her to dance with him. So young and innocent. I was really hoping it was one of you 3 on the right side of row one of the pit. I was rooting for my fellow MN gals! What a night! 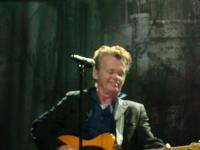 I took my brother and his wife to their first Mellencamp concert and we scored row A seats. They were center front row right behind the pit. My brother has never been a Mellenhead so to speak, because he always teased me that John's songs all sound the same. (I bark back and say.....So does Petty, Stones and Dylan's, his icons.... He is 4 years older than me).... I will tell you. when we left the venue to walk to our Hotel room that was 9 blocks away in the bitter cold, all he could talk about was how great the band was and how professional John is and what a story telling heart felt show! He will be converted to a Mellenhead sooner than later..... It can't be avoided. And he thinks that I won't be able to score tickets like this again. I just smiled at him. I have done it so many times, I will do it again! 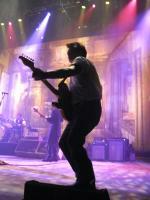 John is worth being that close and center to him even though I don't think there is a bad seat in the Orpheum Theater. I absolutely love Theater Tours. It's been since 1997 since his last one. It was well worth the wait. I encourage all of you, if you want to see a "Show" from a Singer, Songwriter Rocker, with a top notch band that takes so much pride into their work, this is the tour to find a show to attend. I too am still on cloud nine from last night, in fact I couldn't sleep last night, because I was rehashing the entire storyline and songs in my head into the wee hours of the night. It made for a very long workday, but I survived. We are thinking about checking out tickets for the Ames Iowa concert in April because I want to see if I missed anything last night. I was so aware of everything and everyone that was going on onstage,.....but for some reason my eyes and heart kept following John and his every move. That man can sure dance! I giggle everytime when he starts to peel off his layers of clothing as the nights progresses and the women all love it. HA. Thanks for posting the comments from the Star Tribune. I read them, before I read the writer's take on a performance in this particular newspaper. I too, have learned a lesson from this guy. I still don't quite understand what he expects from someone like John and his 30 plus year career? It makes the mind a bit weary. But then again not to judge, Music reaches each of our souls a different way.